The first and last economic depression that you will experience in your lifetime is just ahead. The year 2009 will be the beginning of the next long-term winter season and the initial end of prosperity in almost every market, ushering in a downturn like most of us have not experienced before. Are you aware that we have seen long-term peaks in our stock market and economy very close to every 40 years due to generational spending trends: as in 1929, 1968 and next around 2009? Are you aware that oil and commodity prices have peaked nearly every 30 years, as in 1920, 1951, 1980 — and next likely around late 2009 to mid-2010? The three massive bubbles that have been booming for the last few decades — stocks, real estate and commodities — have all reached their peak and are deflating simultaneously. 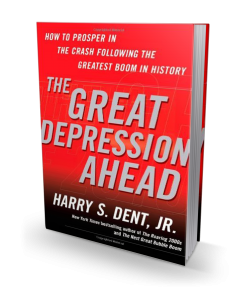 Bestselling author and renowned economic forecaster Harry S. Dent, Jr., has observed these trends for decades. 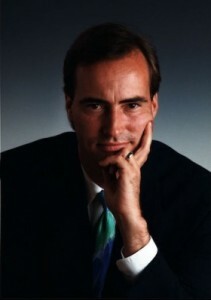 As he first demonstrated in his bestselling The Great Boom Ahead, he has developed analytical techniques that allow him to predict the impact they will have. The Great Depression Ahead explains “The Perfect Storm” as peak oil prices collide with peaking generational spending trends by 2010, leading to a more severe downtrend for the global economy and individual investors alike. Stock prices start to crash again between mid- and late 2009 into late 2010, and likely finally bottom around mid-2012 — between Dow 3,800 and 7,200. The economy enters a deeper depression between mid-2010 and early 2011, likely extending off and on into late 2012 or mid-2013. Asian markets may bottom by late 2010, along with health care, and be the first great buy opportunities in stocks. Gold and precious metals will appear to be a hedge at first, but will ultimately collapse as well after mid- to late 2010. A first major stock rally, likely between mid-2012 and mid-2017, will be followed by a final setdback around late 2019/early 2020. The next broad-based global bull market will be from 2020-2023 into 2035-2036. Conventional investment wisdom will no longer apply, and investors on every level — from billion-dollar firms to the individual trader — must drastically reevaluate their policies in order to survive. But despite the dire news and dark predictions, there are real opportunities to come from the greatest fire sale on financial assets since the early 1930s. Dent outlines the critical issues that will face our government and other major institutions, offering long- and short-term tactics for weathering the storm. He offers recommendations that will allow families, businesses, investors, and individuals to manage their assets correctly and come out on top. With the right knowledge and preparation, you can take advantage of new wealth opportunities rather than get caught in a downward spiral. Your life is about to change for reasons outside of your control. You can’t change the direction of the winds, but you can reset your sails! With his track record of accurately predicting Japan’s collapse in 1989, the dot-com bubble-bust in 2000 and the housing bust in 2006 to 2007 (among many other things), he has appeared on Good Morning America and PBS, and is a regular guest on CNBC and Fox Business. He’s been featured in Barron’s, Investor’s Business Daily, Business Week, The Wall Street Journal, and American Demographics. And he’s written numerous books, including The Great Boom Ahead (1992), The Great Depression Ahead (2008), The Great Crash Ahead (2011) and The Demographic Cliff (2014).